With the worldwide release of the iPhone complete, numerous publications are releasing their reviews of Apple's latest gadget. Gizmodo provides some interesting observations about the iPhone 3G. They comment on the plastic backing, and acknowledge that the device feels cheaper than the original aluminum backed iPhone. This "cheaper" feeling, however, has been somewhat debated by individual observations. The trade-off in using plastic, of course, is improved signal strength. Gizmodo found that Wi-Fi reception was a bit better in the new iPhone. In their testing, they were able to walk up to 120 feet away from an access point before losing a connection. In the same test, the original iPhone dropped the connection at 100 feet. The screen is also described as warmer, slightly brighter and better for daylight viewing. This "warmer" quality has generated some complaints about a yellow-tint to the 3G's screen that is most noticeable when compared directly to the first iPhone. Audio quality in the 3G phone has been said to be much clearer, with Gizmodo describing it as the difference between "someone with their hand over their mouth and with their hand taken away." This improvement was also mentioned by a number of earlier reviewers. iLounge had a dissenting opinion on this and found that with the exception of Bluetooth calls, in which the iPhone 3G was superior, the handset and speaker audio were comparable. Engadget notes that the GPS acquisition is "surprisingly fast for a cellphone" and credits this to the iPhone's use of both GPS, cellphone towers and Wi-Fi access points to help determine location. One point of confusion is whether or not 3rd parties will be able to offer a turn-by-turn GPS solution for the iPhone. Questions about SDK conditions and antenna size have been raised in previous reviews, but TeleNav confirmed to Gizmodo that they will be launching a 3D moving map GPS application with turn-by-turn voice guidance. Additional iPhone 3G first impressions have been posted by MacRumors readers in this discussion thread. 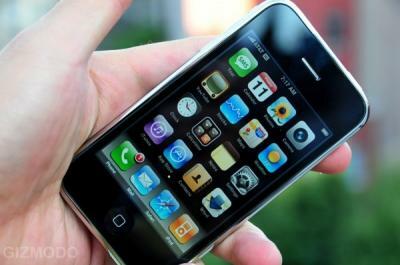 Despite activation issues, the iPhone 3G appears to have had strong sales with reports of it selling out in Europe as well as AT&T stores. Apple is again providing an iPhone Availability tool that will be updated at 9 p.m. nightly.